Of the ten vicars in the first hundred years of St. Matthew's existence, the most dominating personality was that of the first incumbent, the Rev'd Newton Price. In the last half of the 19th C, there was a growing need for a new church in the rapidly growing district of New Bushey, now known as Oxhey. At first, a site at the corner of Aldenham Road and Chalk Hill was considered, but the Rev'd Newton Price, then Chaplain of Oxhey Chapel, urged that the western side of the railway should be considered, saying that it was on the hitherto unbuilt land that the district would develop. The Ecclesiastical Commission of March 25th, 1879 agreed a sum of £50 a year to be paid for a church, under the the New Parishes Act - the Peel Acts. These Acts, passed in 1843, authorized new Church of England parishes under certain conditions; the population of the new parish had to be at least 4,000 and half the sittings in the church had to be free. He died in 1907. In the Lady Chapel over the altar is a tribute to him; a stained glass window of "The Crucifixion". He is also commemorated there with a stone plaque. 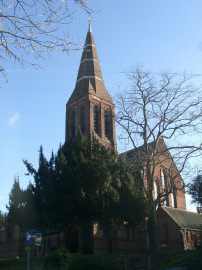 The decision to create the parish of Oxhey was opposed by the Vicar of Watford, the Rev'd Richard Lee James, once Chaplain of Oxhey Chapel, who felt that another place of worship was not needed in the district and, if it were to be built, then it should be an offshoot of St. Mary's, Watford. The Rev'd. 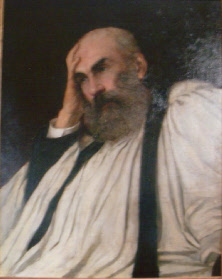 Newton Price strongly disagreed and insisted that the new parish must be separate from Watford. Incidentally, this was to his financial advantage, because under the Peel Acts, he was entitled to the fees and emoluments; a fact established in June 1894 when Counsel's Opinion confirmed this. He earnestly wished for a parish hall, firmly believing that it was wrong to use the church for anything other than worship and was not at one with his parishioners over priorities. In this instance, the parishioners prevailed in their preference for a peal of church bells rather than a hall, although a hall was built eventually. He started the parish magazine in 1882, making it the oldest in the Deanery. He held strong theological beliefs and would have been horrified at the ecumenical views held today. In the Parish Magazine of December 1895 and again in October 1897, he attacked the practices of the Roman Catholic Church. He seems, from remarks made in articles written by him, to be almost equally at odds with the Nonconformists. It was as a pioneering educationalist that he perhaps had the most lasting influence. He was the vice-chairman of the Bushey School Board and manager of several schools. In 1873, while Chaplain of Oxhey Chapel, Newton Price had introduced the teaching of cookery to girls into the Watford Heath School, one of the first places to do so. The school buildings still exist; Nos. 3 and 4 were the main school, and No. 5 behind, the place where cookery was taught. They have been transformed into charming cottages, No. 3 retaining the original porch and cupboard. He insisted that cooking must be done on a kitchen range to ensure that the pupils learnt in conditions as much like home as possible. There were six to a teacher. More pupils could not be included as there was only one fire. He met opposition from other members of the Board when he wished more time to be given to cookery, because they feared an increase in rates. Because of the youth of the children, he opposed the teaching of nutritional values and was a firm believer in practice, not in demonstration. He was even responsible for coercing the nearby grocers to stock haricot beans and macaroni, hitherto unknown in the neighbourhood. Later he arranged for school dinners to be served at a penny each. Some of the pupil teachers were sent to the South Kensington School of Cookery at the end of their course. The teacher's salary varied; an assistant, 13 or 14 years old, received half a crown a week. He was the Chairman of the Hertfordshire Needlework and Cookery Association and despite the impression he gives elsewhere that he was far from a feminist, he maintained that "lady inspectors" should be appointed for these subjects. In 1887 he gave evidence before the Royal Commission on Education, chaired by the Viscount Cross, who, as Richard Cross, had been responsible for one of the earlier Education Acts.